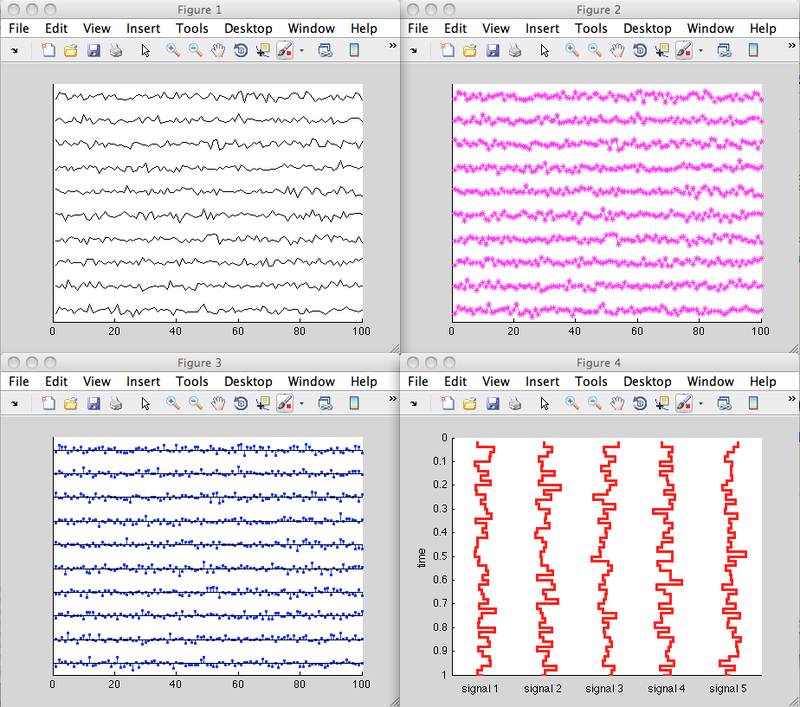 Reader JP asked me about my recent blog post on the Hough transform. Specifically, she wanted to know exactly how the rho-theta coordinate system was defined. When I answered her question, I realized that our documentation isn't very clear on this point, so I thought I'd post the answer here. Suppose you have a pixel at (x=25, y=25). (Note that the Image Processing Toolbox convention is that the x-axis is the horizontal axis, the y-axis is the vertical axis, and the origin is at the upper left.) There is a family of lines that all go through (25,25). The solid blue line in the diagram below is one such line. 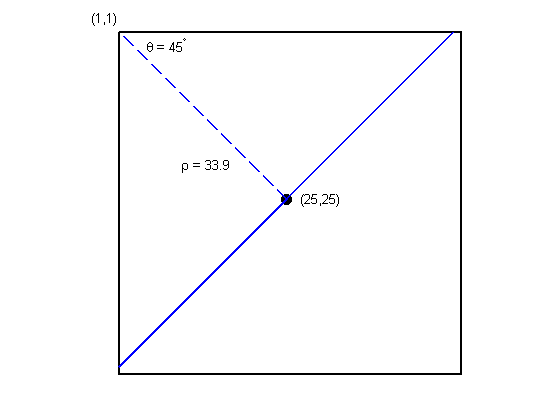 Draw a perpendicular projection from the upper left pixel to the line; that's the dashed blue line below. The length of the projection is rho. The clockwise angle between the projection and the horizontal axis is theta. Let's try this with an image. There is a vertical line (theta = 0 degrees) that goes through the (25,25) pixel, and this line is 24 units away (perpendicular distance) from the upper left pixel. Let's look at another spot. There is another line through (25,25) whose perpendicular projection from (1,1) is 75 degrees from the horizontal axis. The length of perpendicular projection to this line from (1,1) is about 29 units. That's about it. 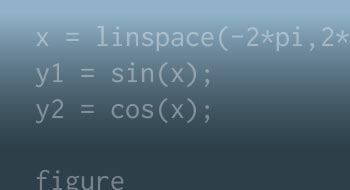 I'll ask our writer to add more information about the Hough transform coordinate system to the Users Guide. Should min and max Marry? can you please explain more about rectangular or building detection using hough transfom. Alaa - I've never implemented a rectangle detector myself, so I don't have information readily at hand to give you. However, there appear to be many papers on the subject on the Web. 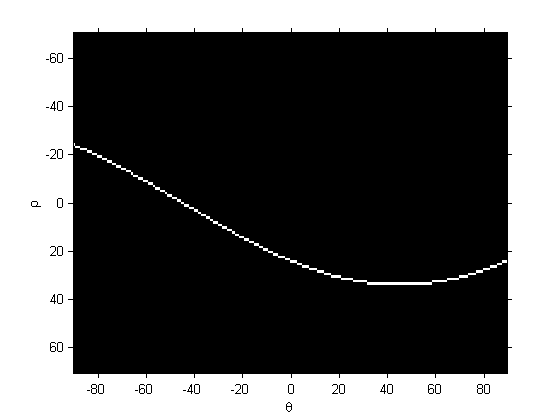 Daphne—The hough function doesn't "ignore" any points. You might want to look at the 'FillGap' optional parameter for the houghlines function. Yael—I think I understand now. You can find an M-file implementation of hough in the book Digital Image Processing Using MATLAB. You should be able to take that code and modify it to weight pixels' contributions to the accumulator array. Note: that code was written before the function accumarray was added to MATLAB. If I were writing that function today as an M-file, I'd use accumarray. 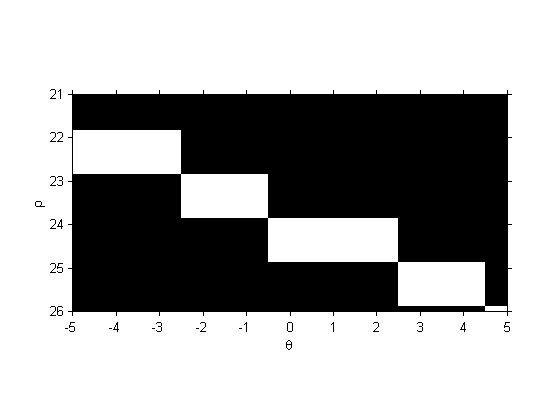 Ashok—The basic Hough transform is for detecting lines, not rectangles, so you'll have to do some algorithm development work in order to determine whether the detected lines form are rectangle. Try doing some searches on "rectangle detection" to get some ideas. 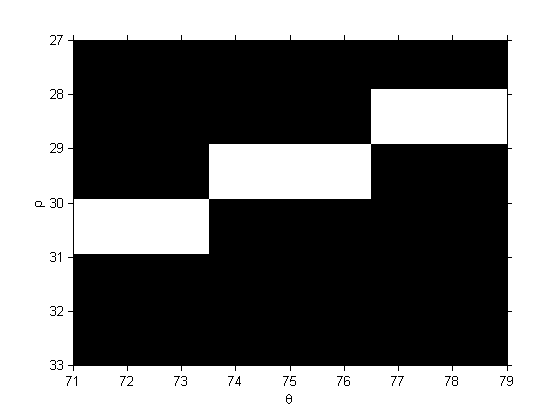 After generating the H for a binary image and summing the value of rho across the theta axis, (i.e., summing the columns of the array), I found that the value of sum of rho for each theta are the same. I can’t figure out why is that so. Thanks! WC—For each theta value, every foreground pixel gets assigned to exactly one accumulator bin in the corresponding rho column. Therefore, the column sum of the accumulator array H is simply the number of foreground pixels in the input image. i have a binary image containing some lines. want to find longest line of all. how to perform pixel calculations on maatrix? Ashok—You might find the hough, houghpeaks, and houghlines functions to be useful. hello can this hough transform be used for an irregular image for which the edges are obtained? Rajkumar—What do you mean by "irregular image"? TG—I don't know. I've never tried it.